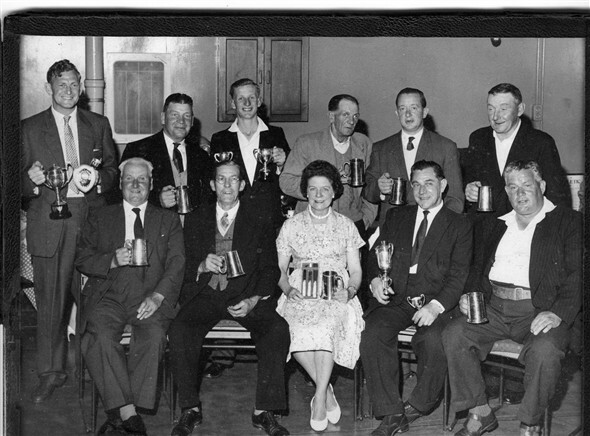 Darts Trophy presentation - Circa? Darts trophy presentation at The Crown, Newhaven. Cyril Walton (my father-in-law) is in the front, second from right. Who are the others? This page was added by Carol Walton on 02/05/2008. Second from the left in the back row is Arthur Rollinson. Second from right back row is Sammy Clarke, sailed with him on the Brighton. I think the man second from left in the back row is David Bain's father. Yes the man second from the left in back row is Tommy Bain and Peter Flowers is third from the left.